This year's expected 6.1-inch LCD iPhone may come in white, black, taupe, gold, "flash yellow," "bright orange," and "electronic [sic] blue" colors, a recent report suggests. 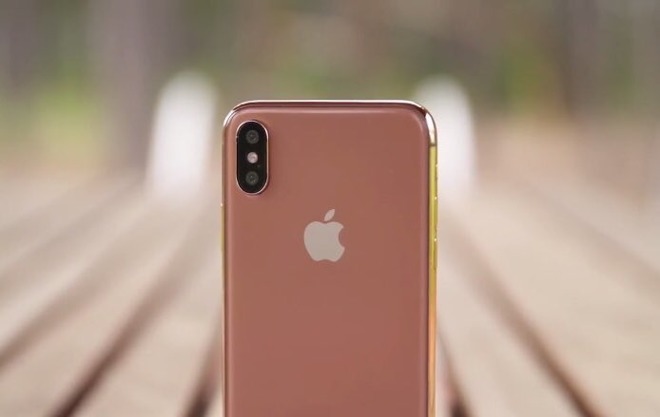 An iPhone X mockup in 'blush gold,' a color Apple never actually shipped. The shades should be similar to Apple's current leather iPhone cases, said Japan's Macotakara, citing predictions by supply chain sources. The claim is questionable, since the website has a mixed track record and Apple has been mostly conservative with iPhone colors since 2014's iPhone 6. On the other hand, well-connected TF International Securities analyst Ming-Chi Kuo has proposed that the phone will ship in gray, white, blue, red, and orange. Those mostly align with the Macotakara report, with the exception of red, "flash yellow," and taupe. The last iPhone to come in a truly diverse set of colors was 2013's iPhone 5c. That product used a plastic shell though, making alternate colors easier to produce, whereas every 2018 iPhone is forecast to use a mix of glass and metal. Aside from the 6.1-inch phone, which could cost around $600 to $700, the other iPhones in the works for 2018 are believed to be 5.8- and 6.5-inch OLED models, starting at about $800-900 and $999. All three should have edge-to-edge displays, and TrueDepth cameras for Face ID and animoji.